The Maldives conjures up idyllic images of over-water bungalows and pristine beaches. However, visitors are often surprised to find that there are more things to do in the Maldives than what they expected. There's something for everyone, regardless of whether you prefer an active, or inactive, vacation. This makes the Maldives a very versatile destination! Read on to see what activities are popular. The Maldives is made up of more than 1,000 coral islands. Therefore, the snorkeling is naturally spectacular! All resorts in the Maldives offer this activity. However, ideally, you'll want to choose an island with an in-house reef where you can go snorkeling directly from the beach (or your over-water villa!) instead of by a prearranged boat trip. The quality of the reefs does vary. Angsana Ihuru, in North Male Atoll, is regarded by many to have the best in-house reef in the Maldives and the resort can easily be reached by speedboat from Male. In the same area, Fihalhohi Island Resort is excellent. Other luxury resorts with outstanding in-house reefs and snorkeling are Diamonds Athuruga, Vilamendhoo Island Resort and Spa, Mirihi Island Resort, and Lily Beach Resort. These are all located in South Ari Atoll. In North Ari Atoll, Kandolhu is excellent. The Park Hyatt Hadahaa and Robinson Club are remote options situated within North Huvadhoo, one of the deepest atolls in the Maldives. If you're on a budget, try Biyadoo Island Resort in South Male Atoll. The Maldives is regarded as one of the best scuba diving destinations in the world. You'll be able to get up close and personal with an abundance of sea creatures including turtles, mantra rays, moray eels, and rare whale sharks. Varied reef structures and deep channels provide exciting diving opportunities. If you're super serious about scuba diving, the best option is to book a liveaboard boat trip. These luxury cruise boats visit some of the most remote reefs and will allow you to explore places beyond the reach of resorts in the Maldives. The optimal time to go scuba diving is from January to April. However, most liveaboards operate from November to May. 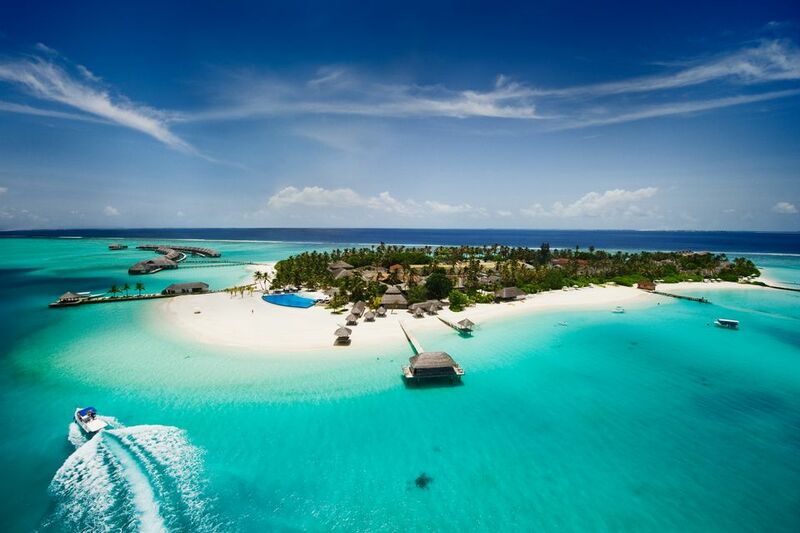 Top options are Carpe Diem Maldives and Maldive Mosaique. Banana Reef, in North Male Atoll, was the first Maldives dive site to be discovered and remains very popular. Some islands surrounding it are Farukolhufushi, Fullmoon and Kurumba. The superb in-house reef at Angsana Ihuru, in North Male Atoll, has its own shipwreck called the Rannamaari. Ari Atoll (one of the largest atolls in the Maldives) is home to many popular dive sites and most liveaboards visit it. There are also numerous resorts in the area that have dive centers and offer diving excursions. Maaya Thila, in North Ari Atoll, is particularly famous and one of the best spots to swim with sharks. South Male Atoll isn't as developed as North Male Atoll, but the dive sites there are just as good and whale sharks can be found there throughout the year. These resorts all rate well for diving on Tripadvisor. If you do want to stay at a resort but have access to remote diving sites, COMO Maalifushi is the only resort in pristine Thaa Atoll, with 66 islands and diverse marine life. Looking for an inexpensive independent dive company? Try Maldives Passions Dive School or Maafushi Dive & Water Sports on inhabited Maafushi Island (the center of the independent travel scene). The Maldives isn't just known for its snorkeling and scuba diving. It also ranks highly as one of the world's top dolphin destinations. Dolphins are everywhere in the Maldives. They're really friendly and are frequently known to swim up to tourist boats. They may even swim past your over-water villa! Many resorts in the Maldives offer dolphin watching trips as part of their standard guest experiences. However, sightings aren't guaranteed. To maximize your chances of spotting some, head to little-known Meemu Atoll and its Muli Channel (the success rate is said to be 85%). There are only two resorts in the area -- Medhufushi Island Resort and Hakuraa Hura. Closer to Male, in South Male Atoll, luxurious COMO Cocoa Island is situated near a populous dolphin spot. Sunset dolphin cruises are offered. If your budget doesn't extend that far, the dolphin-watching cruise offered by neighboring Biyadoo Island Resort gets good reports. For travelers who aren't staying at one of the resorts, the dolphin-spotting trips run by Cruise Maldives on Hulhumale Island are recommended. All kinds of water sports are possible in the Maldives. Kayaking, paddle-boarding, jet-skiing, water-skiing, parasailing, windsurfing, wake-boarding, kite-surfing -- you name it! Many resorts provide a selection of these activities for free. For an extra adrenaline rush, the Four Seasons Resort at Landaa Giraavar and Lily Beach Resort are two resorts in the Maldives that have jet-blades that will propel you out of the water. Extreme Maldives at the Sheraton Maldives Full Moon Resort & Spa on Furanafushi Island offers a wide variety of water sports and is well-managed. Alternatively, there are independent water sports companies on inhabited islands near Male, such as Maafushi. You can even catch a wave in the Maldives! Most of the renowned surf breaks are located around Male. The surfing season runs from March to October, with the bigger swells from June to August. Atoll Adventures offers surfing packages to Cinnamon Dhonveli on Farukolhufushi Island in North Male Atoll, with exclusive access to the resort's Pasta Point surf break (the region’s most consistent break). The resort has a program designed especially for surfers and a maximum of only 30 surfers are allowed there at a time. Lohis surf break is a popular alternative in North Male Atoll. It's named after Lohifushi Island (now Hudhuranfushi), which it breaks off. This island is considered to be the main surfing island in the Maldives. Adaaran Select Hudhuranfushi has been recognized as the Maldives' leading surf resort and offers special surfing packages. Due to spiraling popularity, a cap of 45 has now been placed on the number of surfers permitted to stay there. The surfing scene on Huraa Island in North Male Atoll is buzzing as well, due to the large number of surf breaks within easy reach and several guesthouses that provide inexpensive accommodations. Famous breaks include Sultans, Honky's, and Chickens. The Four Seasons Resort Maldives at Kuda Huraa has an in-house surfing school with instructors from Australia. If you want to escape the crowds, head south. The secluded surf breaks there are best suited to intermediate and advanced surfers. Beacons and Tiger Stripes, two of the most powerful waves in the Maldives, are on Huvadhoo Atoll. Addu Atoll (previously Seenu Atoll) has some standout spots too. More centrally located Thaa and Laamu atolls are also starting to attract surfers wanting to get away from the north. However, accommodations are limited, so you may need to take a surf charter to reach the breaks. Surf Atoll is recommended for those who are keen to go on a multi-day liveaboard surfing charter trip to various surfing spots in the Maldives. Don't want to spend all your time at a resort in the Maldives? Boat cruises are a popular thing to do, with various options from sunset cruises in local dhonis to longer overnight and multi-day luxury yacht cruises. Many resorts have their own boats, which are available for guests. The Four Seasons Explorer is one such boat, which functions as a floating resort. Alternatively, Yacht Maldives operates private charters. If you'd prefer to join a group, G Adventures offers this 7-Day Small Group Maldives Dhoni Cruise from Male to Male. Airbnb has some options for boat rental as well. What's more, it's possible to visit some luxury resorts in the Maldives on day trips, such as those offered by Cruise Maldives. Cruise Maldives also operates reasonably priced boat cruises. Male, the capital of the Maldives, is densely compressed onto an island of about two square kilometers (1.25 square miles). It's one of the world's smallest capitals! Most visitors bypass it in favor of the country's idyllic uninhabited islands. However, culture vultures will find it an interesting place to explore. There are mosques, museums and markets. And, Male's compact size means it only takes a couple of hours to stroll around it. The National Museum provides insight into the country's heritage. Its collection encompasses royal antiques, artifacts, coins, photos and other memorabilia from the days of the Sultanate. Thrones, palanquins and statues are highlights. The museum is located in Sultan Park, which was part of the Sultan's palace. The National Art Gallery is within the complex too. The Islamic Center's landmark Grand Friday Mosque is the biggest mosque in the Maldives. Opened in 1984, it has a modern plain white marble exterior and gold dome. Nearby, the historic Old Friday Mosque (Hukuru Miskiiye) and graveyard provide quite a contrast. It's the oldest mosque in the Maldives and dates back to the 17th century. Notably, the mosque was constructed using stone made from coral. You'll need to go inside to appreciate its beauty. Medhu Ziyaaraiy, the tomb of Abdul Barakat Yoosuf Al Barbary from Morocco, who introduced Islam to the Maldives in the 12th century, is in the same area. Head towards the harbor to see the fascinating local market where fruit, vegetables and freshly caught fish are sold. The area around Alimas Carnival, next to the Hulhumale ferry terminal, is known for its hip coffee shops and cafes. If you'd prefer to take a guided tour, Secret Paradise offers comprehensive full and half day Male city walking tours. The Male walking tour conducted by S&Y Tours and Travel is shorter. Do keep in mind that the Maldives follows strict Islamic practices. So, be sure to dress respectably, covering your legs and shoulders. In addition, women must cover their head with a scarf or cloth to enter mosques. Men will need to wear a shirt and trousers. No t-shirts or shorts. Due to a change in law, tourism is now permitted on inhabited Maldives islands. Many resorts offer excursions by boat to these islands and fishing villages, where you can interact with local communities and enjoy local food. And, if you think visiting the Maldives is expensive and perhaps even unaffordable, think again! Tourists can stay in village guesthouses (some of which are quite boutique and attractive) and experience the simple local way of living. Most are close to Male, on islands such as Hulhumale, Maafushi, and Guraidhoo. Guests at the Shangri-La Villingili Resort and Spa have the option of exploring five neighboring islands by bicycle or on foot. Secret Paradise on Hulhumale Island offers full and half day island hopping tours, plus activities such as cooking lessons and meals with local families. S&Y Tours and Travel on Male is also recommended. Need to relax and rejuvenate? There's possibly no better place to get a spa treatment than the Maldives, with the soothing ocean as a backdrop. Many resorts in the Maldives have spas. However, some really stand out for their unusual settings. The spa at Huvafen Fushi is the world's first underwater spa, with two glass-walled treatment rooms. Four Seasons Resort Maldives at Kuda Huraa spa is situated on its own separate island, which guests are transported to by boat. Its defining feature is its Night Spa with four special lunar rituals on the beach. If you're a nature lover, don't miss the spa at the Six Senses Laamu. Its cocoon-shaped treatment rooms are made from twigs and branches twined together! Drift Spa at Niyama Private Island Resort also has a delightfully intimate setting. Veli Spa at Kurumba wows guests with its lush garden spa, the first spa in the Maldives to feature traditional herbal remedies. Award-winning Duniye Spa has locations at many resorts in the Maldives. Other top spas in the Maldives are Talise Spa at Jumeirah Vittaveli, Banyan Tree Spa Vabbinfaru, and Angsana Spa Ihuru. Peal Sands Hotel is a relatively inexpensive option on Huraa Island. Secret Paradise offers lunch and spa trips there. Yoga retreats are growing in popularity in the Maldives. Secret Paradise arranges reasonably-priced seven day yoga holidays, with twice-daily sessions. A range of yoga styles are practiced. Some resorts also offer in-house yoga classes, including morning and sunset yoga on the beach, followed by pranayama and meditation. Kurumba Maldives, Baros, Four Seasons Resort Landaa Giraavaru, COMO Coco Island, and Jumeirah Vittaveli are all known to have decent yoga classes. With a view like this, you can't miss spending some time (or a lot of time) soaking up the sun in a strategically placed hammock. It's certain you won't want to move!